THE PNG Hunters will play the Penrith Panthers NSW Cup side as part of the official opening of the National Football Stadium on the 6th of next month. PNG Rugby Football League chief executive officer Bob Cutmore announced yesterday that following a request from the NFS trustees, who wanted to acknowledge the history associated with NFS, formerly the Lloyd Robson Oval — the spiritual home of rugby league in Port Moresby — the Hunters agreed to the official trial match. 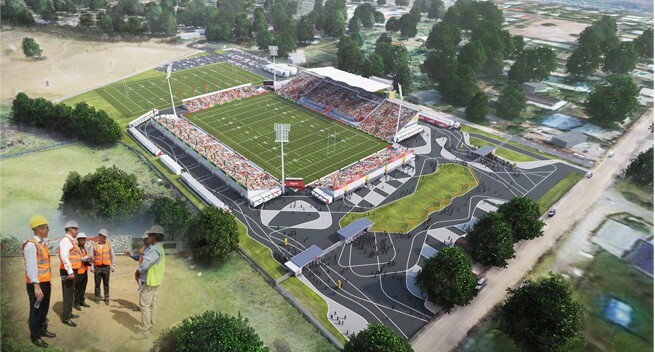 Cutmore said the PNGRFL and Hunters acknowledged the legacy associated with the NFS and believed that it was only fitting that PNG’s favourite team launched the stadium with a game against Penrith. Prime Minister Peter O’Neill will kick-off the match to mark the opening. “The SP Hunters would like to thank the National Football Stadium’s trustees for being given the opportunity to play the first game at the new stadium as we recognise the history that the oval shares with rugby league in Papua New Guinea,” Cutmore said. He said that on July 6, 1975, the first PNG Kumul team under the captaincy of Paul Chue, played a Great Britain touring side, who were on their way to Australia at the then Lloyd Robson Oval, eventually losing 12-40. Cutmore said the game against the Panthers would give the PNG rugby league community the opportunity to view the facilities, as well as see the Hunters perform there for the first time. For the new players, Cutmore said it would be their opportunity to impress coach Michael Marum in an effort to make the Hunters squad for the first game against South Logan Magpies. The trial at the NFS is a one-off event as the SP Hunters are still negotiating in respect to a host venue for this season. Oil Search general manager Gereo Aopi said the NFS had a long history. Some of the current NFS trustees were either players or officials of rugby league at the former PRL. Aopi has vivid memories of being a ball boy at the venue, while Cutmore was a referee. Current president of POMRFL and member of the trustee Dr James Naipo played on the field with with Tarangau rugby league club and the PNG Kumuls. The NFS was built to become the home of rugby league in the country through a public-private partnership arrangement between the Government and Oil Search Ltd through the tax credit scheme.